General Characteristics: Medium in height, well spreading, maturing within 8 to 12 months, producing from 5 to 10 oha; identified by widely spreading, light yellowish-green to almost whitish petioles. Petiole: 75 to 90 cm. long, light yellowish-green to whitish, distinctly reddish at edge, brownish at apex, a white or faint cream-colored ring at base with white for about 3 cm. above. Leaf blade: 45 to 55 cm. long, 30 to 40 cm. wide, 35 to 45 cm. from tip to base of sinus, ovate, concave, pendant, light green; margins with numerous fine undulations, the marginal veins hard and crisp in texture; piko yellowish to light brownish; lobes obtuse with narrow sinus. Corm: Flesh white with yellowish fibers; skin cream-colored. Inflorescence: Peduncle whitish; spathe 19 to 22 cm. long, the lower constricted portion 3 to 4 cm. long, light green, the upper portion light yellow, somewhat open; spadix 7 to 9 cm. long, the sterile appendage 7 to 10 mm. long. 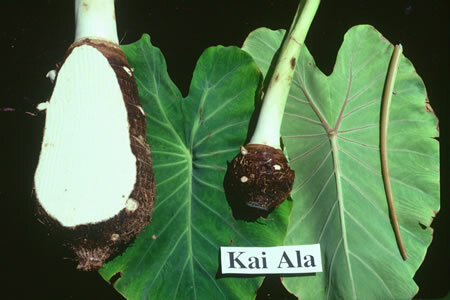 Origin, and derivation of name: Native variety; the name Ala refers to the fragrant odor of the cooked corms, a characteristic common to all varieties of Kai. Distribution: Found only occasionally, almost exclusively under wetland culture, usually associated with Kai Kea. Use: Makes poi of good quality.